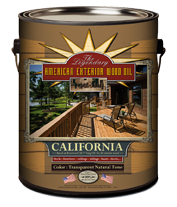 California is a high quality exterior wood finish. and as formulated with the mildew protection. It helps to preserve that freshly-milled look. 3-way oil protection: water repellant – durable – deep penetration. Gives longer life to all species of wood. Approx. 50 m2 per gallon (3.8 l) per coat, depending on the type of wood. Apply 1 coat of California on outdoor furniture, decking or docks. After 6 months you can apply a thin coat again the wood will be protected for minimum 2 years from now. The product should be applied at temperature (minimum 16C) and at normal air humidity (55 to 75 %). Wait minimum 6 months in between coats.